Last week, Tony Ruscoe found an interesting reference to Salesforce in a CSS file used by Google Apps. According to the company, "Salesforce.com is the worldwide leader in on-demand customer relationship management (CRM) services. More companies trust their vital customer and sales data to salesforce.com than any other on-demand CRM company in the world." Other people found references to Google products in Salesforce's applications: a button to compose a message in Gmail and a button for Google Docs, so the integration is probably in the final stages. "Openness is a virtue – the best CRM and the best online productivity suite are lined up for a deep integration", thinks Steve Andersen. In June 2007, Google signed a partnership with Salesforce to include Google AdWords in its applications, but Wall Street Journal speculated that the result "could be a Web-based offering that integrates some of Google's online services such as email and instant-messaging with those of Salesforce.com, whose customer-relationship management tools help salespeople track their accounts." Maybe this year Wall Street Journal's prediction comes true. A sync between SFDC and Google calendars would be awesome. A few years ago I made a feature request to SFDC on a built in email client, it seemed crazy that the email was only for outgoing. The service team told me this was something in the works in the near future. All of the Idea Exchange requests related to incoming mail have been closed, so Gmail integration makes a lot of sense. Since SFDC has added content management in the latest release, this would be a logical step, since they are already acquainted with each other. To me it seems unethical for any service to generate e-mail messages that can't be replied to. All the social networking sites do it, even, amazingly, Orkut. Secondlife does so too and I've complained. The irony is that the companies involved don't have to expend a lot of effort to fix this. Just allow (no, require) every user of such a system to supply a valid return (actually reply-to) address to be used for such messages. Said address can be invisible to all but those that receive such e-mail. Most of the messages I get that way from Secondlife, Orkut, and Facebook are from people I don't actually know (or care to know) and are no different than spam. The companies involved are in effect facilitating spam, even if ,technically, they are doing so with your permission. Its already done by SFDC, I saw it in one of the demos currently playing on SFDC site. Pretty cool feature, you only need to provide in a specific template format on google spreadsheets for e.g. and on click of a button all data goes in SFDC ! Zoho CRM is a free customer relationship management suite (up to 3 users). If you require more users, there are paid options. I have been trying it for my day-to-day tracking of prospects and sales opportunities for 2008. The interface is clean, simple, but best of all it is fast. Something that not all CRM solutions can boast. It also runs cleanly in my browser, Firefox (take note other CRM providers!). As far as what I have used it for so far, I give it a big thumbs up. The link for the Google Docs integration is actually here at the Perspectives on Salesforce.com blog. 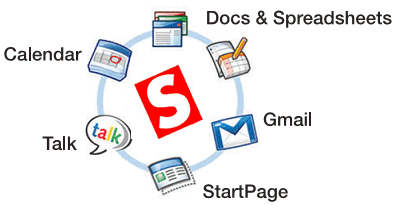 Can I use Google apps as my mail server and host my webpages on another server? For even more integration features, try Cirrus Insight http://www.cirrusinsight.com It puts a Salesforce sidebar right inside Gmail so you can see relevant Lead and Contact info from Salesforce. You can also save emails into Salesforce. For another tight integration, check out The Scoop Composer by CloudGizmos (http://www.cloudgizmos.com/salesforce-gmail-integration). It gives you contextual Salesforce data (standard and custom objects) within Gmail and gives you the ability to instantly create Leads, Contacts, and custom records. You can also log your emails in Salesforce from within Gmail. Great Post Thanks For Posting And Sharing With Us.We Are Provides Mobile Sales App Integration.